My family doesn't have cable, we don't watch live television and we gave up our home phone years ago. We used to have cable. In graduate school my husband and I would watch horrible cable television while working on papers into the early hours of the morning. Then like a lot of people in our generation we graduated and were struck with the cold reality of a bad economy, aka no jobs. The jobs we did find were in retail, my husband woke up at 3 in the morning to help unload the truck at a toy store. So we did what needed to be done, we moved to a cheaper apartment, cancelled cable and switched to cell phones only. Our friends couldn't fathom not having cable, especially since we only received 3 channels through the regular television. We survived and eventually bought an Apple TV and Roku, which made regular television pretty much useless. The last time we watched live television was so far back I don't remember when it happened. Instead we watch Netflix and Hulu plus, use our computers and save the 130 dollars we paid on cable when we were younger. None of us miss it, we can watch pretty much anything we want between our Apple TV and computer and it gives us more time outside the house enjoying family time. It's also one of the numerous ways that I save money in order to stay at home with my kids. I have two active and growing boys that eat more food than I would think possible. I shudder to think how much food they will eat as teenagers. I try to keep a variety of after school snacks that they can eat while I prepare dinner. Today I tried a new recipe for Apple Pie Mini Muffins from the November 2013 issue of Parents Magazine. This recipe has 11 ingredients. 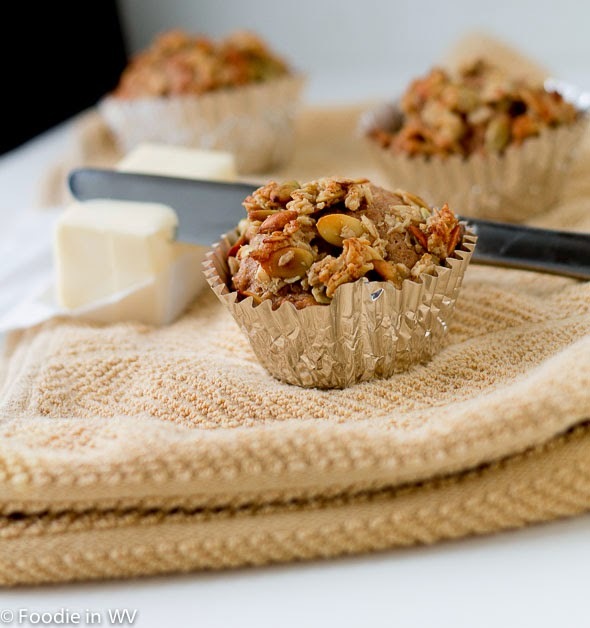 It takes 45 minutes of total time, 30 minutes of which is active and makes 36 mini muffins. I made a number of changes to the original recipe. The most obvious being that I made full size muffins instead of mini muffins. I ended up with a total of 12 regular sized muffins and one jumbo muffin I baked in a custard cup. Instead of using a food processor I mixed the muffin topping by hand. I also toasted my own pumpkin seeds since the ones I could find at the store where raw. I found that my total cooking time was slightly increased by approximately 5 minutes. Additionally I rotated the pan halfway through the baking time. 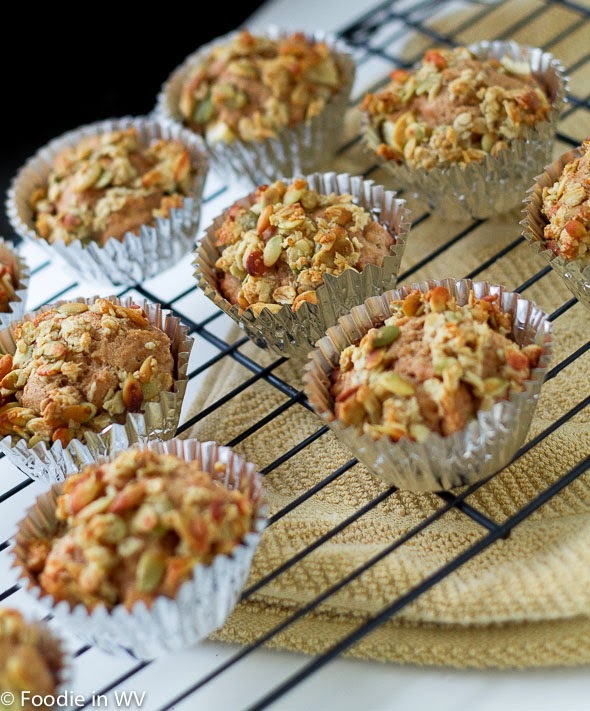 I like that these muffins have pumpkin seeds, oats and apples. It's a nice way to sneak a little nutrition into my kids diets. The batter will be very, very thick when it's prepared. Don't add more liquid, they will cook up fine without it. I did find that the amount of topping was a little short with full sized muffins. You might wanted to double the amount of topping used. Thanks :) They turned out really well, my youngest really liked them! We gave up our landline since we never actually used it. We do have cell phones, but they were cheaper than the phone was with caller ID and all the other add ons. I think landline service would be cheaper here if there was any competition, but there is only one phone company so you are stuck with their rates :) I'm cheap too, and it works for me too! Thanks :) The topping turned out really good! I am absolutely in love with apple pie so these sound amazing. I've been wanting to cancel our satellite but the hubs is into his football. We don't watch that much tv and I've discovered Netflix (which I think is awesome). I haven't try hulu, though. I need to look into that. My husband watches football too. If it is on the computer (apple) you can mirror it onto the television so it's the same as watching it on satellite etc. Not all the games are online, but most of them are. Hulu is nice since it's all the shows that are on the networks, but you can pause it or watch it whenever you want. I never have the time to sit down when shows actually air, so it's nice to be able to watch a show whenever I have time. Thanks, returned the comment :) Have a great end of your week! this looks delicious!!! i will have to look into the recipe. i haven't watched TV in years either. my kids aren't allowed to watch TV on school nights, so i don't watch either. then after they sleep, i usually watch netflix on my ipad while working on my computer. when i do have the opportunity to watch tv, i find myself not really wanting to watch, lol! I tend to watch tv when I'm on the computer too :) I have the same system with my kids. Too much tv makes them not finish their homework etc. The muffins look/sound wonderful! Hubby and I watch very little TV (outside of sports for hubby) We didn't have cable (on purpose) for a good long while, but gave in once just before the NFL draft. ;) The price of cable is ridiculous. Glad I'm not alone :) If you make the recipe tell me how it turns out! These look delicious. I really have go to try them. Thanks for sharing at our Thursday Favorite Things Blog Hop. Thanks for the nice comments and for hosting :) Have a great weekend!